In The History of Chudleigh (1852 and 1875), Mary Jones wrote: 'the attention of the reader has to be directed to the Danish Encampment, on the heights of Ugbrooke Park. This was probably occupied by the Danes about the year 876, as at that time they overran the southern part of the county'. 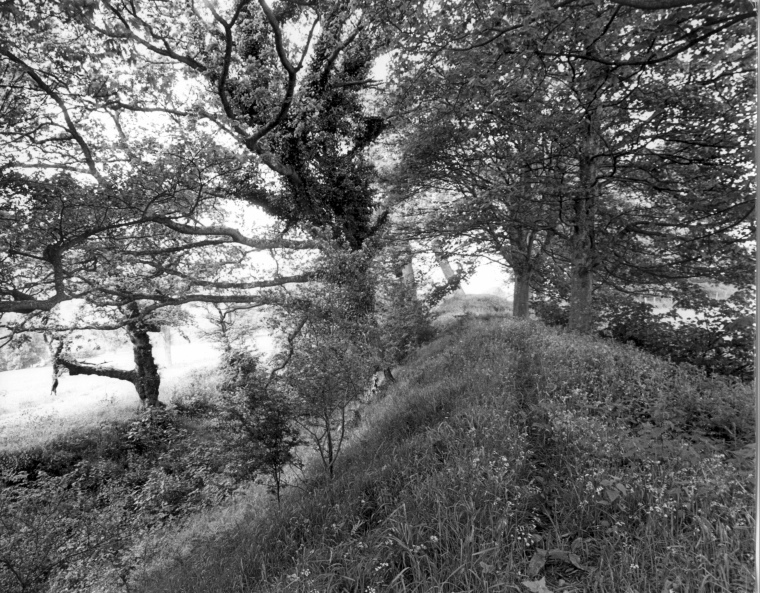 The Chudleigh Book (2009) suggests that it was likely that the first hillfort was developed during the Bronze Age but evidence of this being lost due to a later Iron Age fort at the same place. The defended settlement with an oval bank and ditch enclosed an area of some 200m x 300m with a dyke around the perimeter, hence its name. However, it must be said that the reference to Icknield Way is not correct, as this road ran between Wiltshite and Norfolk; it was the Fosse Way which ran from Lincoln to Exeter. Any road going beyond Exeter – evidence exists (e.g. see The Chudleigh Book) but is fragmentary – might be considerd to be a B-road extension to the A-road Fosse. Not only that, but there is no visible evidence of Roman occupation and as there would be no strategic value in this site, at most it might have been an temporary (overnight) Roman camp. Today, Castle Dyke is on private land, part of the Ugbrooke Estate and so not acessable withput permission from the land owner. However, part of the outer bank can just be made out through the trees from the Gappah Ridge road which runs along the western edge of the estate. The Place Names of Devon goes on to say that Grimsbury (now lost) was Grendelbury (1330 Subsidy Roll), Grendelesbury (1333 Subsidy Roll); other spellings noted up to 1779 were Greenbury, Grinsbury and Grimsbury. 'Bury' in this context means fort so we potentially have the Saxons referring to Castle Dyke as the 'devil's fort'. The following extract is from the Grimspound page of the Legendary Dartmoor website. "Everybody is entitled to their opinion and so firstly, Other Dartmoor occurrences of the ‘Grim’ element are the Grimslake, Grim’s Grave, whilst looking further afield there is Grims Dyke, Grimesthorpe, Grimsbury, Grimsby, and Grims Ditch. To be more specific, ‘Grim‘ comes from the old Norse word Grimr which was an alternative name for Odin. It also referred to a ‘masked’ person or one who conceals his name both of which Odin was renown for, Ekwall, 1980, p.205. The opinion of The Place-Name Society is that the ‘Grim‘ element is an Anglo Saxon word for the Devil and that this appendage was given to any old prehistoric site which they regarded as having diabolical associations, Gover et al, 1992, p. 482. This may well be that the Saxons adapted the word and substituted the Devil for Odin. However, if one consults Clark Hall’s venerable tome, he suggests that the Saxon word grimm means fierce or savage, (2004, p.160) so could the place name refer to the ‘settlement of the savage tribe’?" 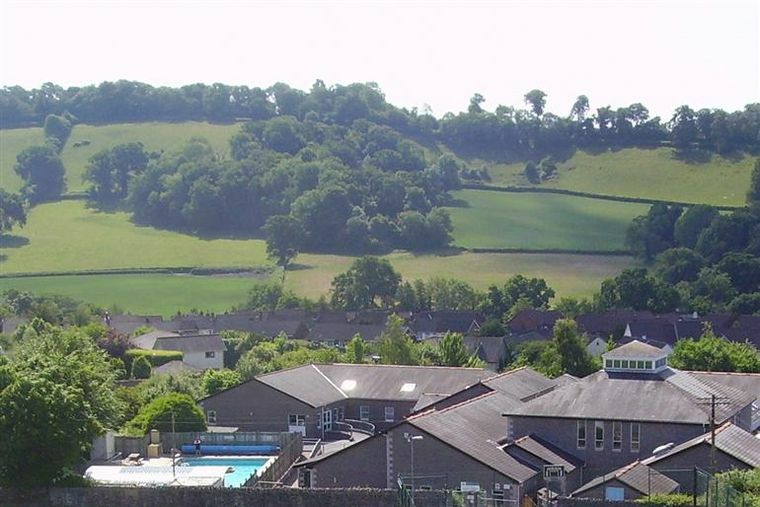 This photograph, taken from the church tower in 2010, shows the primary school in the foreground. To the rear is the ridge that separates Ugbrooke Park from the town and just over the ridge is the site of Castle Dyke. The clump of trees to the middle is Target Wood that roughly marks the location of the former Grimsbury.